Suddenly, we are very busy! Poppy and Aaron are in town and me and Poppy had lunch today and the four of us are dinnering tomorrow. It's going to be pretty swell. I am thrift-shopping this weekend and I have an eye doctor appointment! I think I have found the perfect location for my company's holiday party, we are cruising along on our preliminary work toward moving our office and I've finished a big project I had at work. You should go read this because we ALL love Maira and it's wonderful. I was looking at this space from a year ago and had a great time watching this. I really should watch some episodes - I love it so much. I felt compelled to defend this apple cake/pie thing K had made, which Youngest was eating. And CURRY. It has freaking curry in it! Of course K totally blames me as he says I switched the positions of the curry and the cinnamon in the spice cabinet. And he fed it to Middle and his buddy and ALMOST got away with it. I think I'm going to wait for the next great apple dessert. Poppy and I walked from 19th to 49th today, at a decent clip I might add. While standing at the corner of 21st, I looked across the street and said: is that Oldest? And she said something like: well, I haven't seen Oldest in a few years but...and it WAS Oldest. He was on his way to a meeting and he walked across the street and hugged us like we were old friends. It was the funniest thing seeing him just then...almost as all the funny things Poppy and I talked about today. She's one of my very first internet friends and I luff her and I'm really looking forward to tomorrow evening. Well, if you are seeing the eye doc, then it IS bright lights for you, m'dear!! 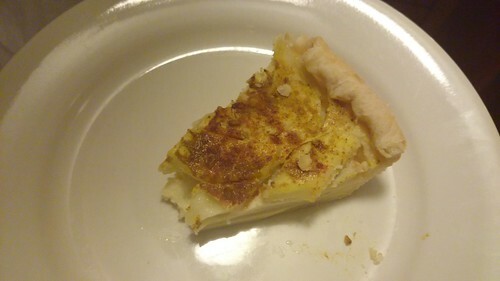 Curry apple pie. New trend! Is it bad that I am slightly (awfully) jealous? In terms of meeting people I beat you: I once met my neighbour on Fifth Avenue. They're not even from Positano (their summer house here), I spotted her and she freaked out when I walk to her, couldn't believe it. How terrific to have your friend in town. Thanks for sharing Maria's post. She is so eloquent with so few words. That apple pie story is very funny. I can just imagine youngest taking a bite and thinking, 'no, that's not right'. But I am curious at an apple pie that has custard cooked into it. Yay for time with Poppy. Yay for visiting friends, and seeing children b happenstance and for said child to be an adult who greets his mum in public. I am loving watching my oldest become -- and do -- the same. Hubs came home from work yesterday with the entire series of WW in a boxed set (a perk of working at a newspaper is being able to buy items submitted to reviewers, for very few $). Can't wait to break it open and start watching it again. I love the curry apple pie story. Here, this goes with that. Oddly enough I've been watching tid-bits from West Wing for about a week now and that one never fails to put a lump in my throat. I once accidentally put garlic butter on an English muffin with jam. It wasn't half bad but I wouldn't want to do it again! I'm with Kim at allconsuming. 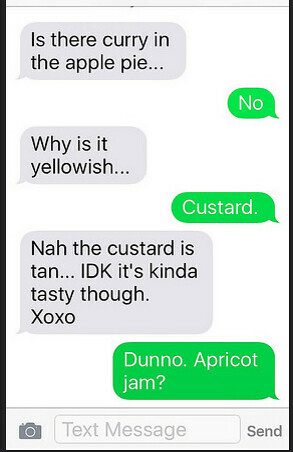 Also curious about an apple pie that has custard baked in it. "Splain please. You and Scot are responsible for me just spending an hour watching WW clips. Bliss. How will I stop now? That was SO WEIRD. I mean--here I am in New York--and it's all "there are eight million stories out there--" and along comes YOUR SON. p.s. That gin and tonic I had on Friday afternoon was the first of MANY.